List of commonly found types of metal and alloys, with their periodic element symbols. 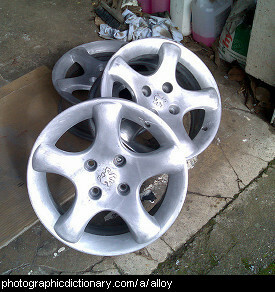 An alloy is a mixture of two or more metals, or one metal and something that isn't a metal. They are mixed together so well you cannot tell that the alloy is not a pure metal. Alloys typically have very different properties to the components that went into making the alloys. Alloys are often much, much stronger than their individual components. Many tools and machines are made from alloys because they need to be strong. Aluminium, also spelt aluminum, is the most common metal in the world, and the third most common element (after oxygen and silicon). 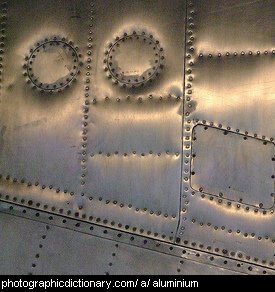 It is durable and lightweight, and is a very important metal for making planes out of. Aluminium is highly reactive and you cannot find pure aluminium in the same way you can find pure gold or copper, so it was once considered a rare precious metal. It is a very energy intensive process to refine aluminium. Aluminium is used for building (particularly frames for doors and windows) and vehicle construction, household aluminium foil, masts on ships, walking sticks, and lots of household utensils and appliances. 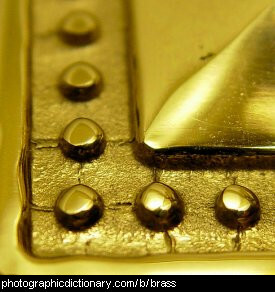 Brass is a metal alloy made from copper and zinc. When it is polished, it is shiny and gold. It is cheap and is used in many places, for making musical instruments like bells and trumpets, for making buttons and zips, and for making shiny door handles. Bronze is a dark metal made from an alloy of copper and tin. Bronze was one of the earliest and most useful metals discovered by mankind. It was harder than copper, stone or wood and could be made into weapons, containers and tools. 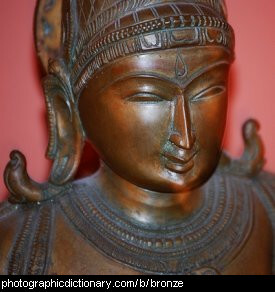 Bronze is still widely used today to make statues, door handles and jewelry. Chrome, or chromium, is a hard, very shiny metal that doesn't easily tarnish or corrode. 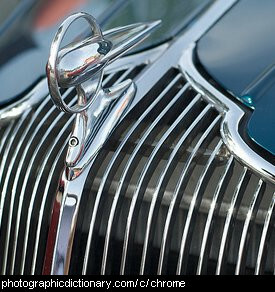 It is most commonly used for plating things with a very thin coat of chrome to give them a decorative shiny finish. Copper is a common, reddish-coloured metal that is used for electrical wiring, and mixed with other metals into alloys like brass and bronze. 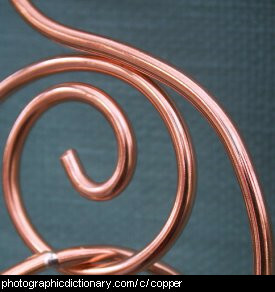 Copper is an extremely good conductor of electricity. Oxides of copper are blue and green, and have been used to colour paints and glaze pots for thousands of years. Foil is any metal that has been rolled into thin sheets. Aluminium foil is commonly used in the kitchen. 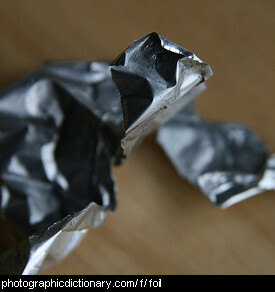 Foil is also another word for thwart. Gold is a heavy, soft, yellow metal that is easy to work with. It is the softest metal, and is very dense, much denser than lead. Gold is very stable and is used to coat other more reactive metals to protect them, but its primary use is in jewelery. 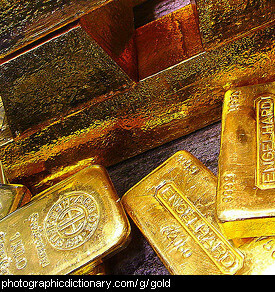 Pure gold is too soft to make jewelery out of, and is usually mixed with silver, copper and other metals. 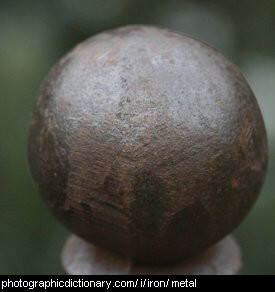 Iron is a common, fairly soft metal that rusts easily. Iron is rarely used in its pure form, it is usually strengthened to make steel. Iron is also the name given to a device used to flatten clothes. Lead is a soft metal that is usually dull grey. It is the heaviest stable metal. It has a relatively low melting point. 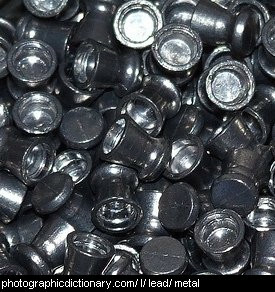 Lead is used in batteries, bullets, solder, pewter and radiation shields. Lead is a heavy metal like mercury and can accumulate in the body and cause poisoning. Lead poisoning was common in ancient times.